Hualalai Golf Course Hole 3: After a couple of uphill par fours, the first downhill par four (complete with ocean views) has a fairway bunker, tree, and OB right, but leaves plenty of room to the left; however, from that side, the player has to hit the green from over the big bunker to the left of the green. Hualalai Golf Course Hole 4: The first par five of the day is relatively easy, especially when downwind. The drive needs to stay clear of the fairway bunker on the left but, there is a wide fairway and from there it is a straight road to the green. The main trouble is the large bunker that covers the entire front-right side of the wide putting surface, although there are more bunkers left and behind as well. 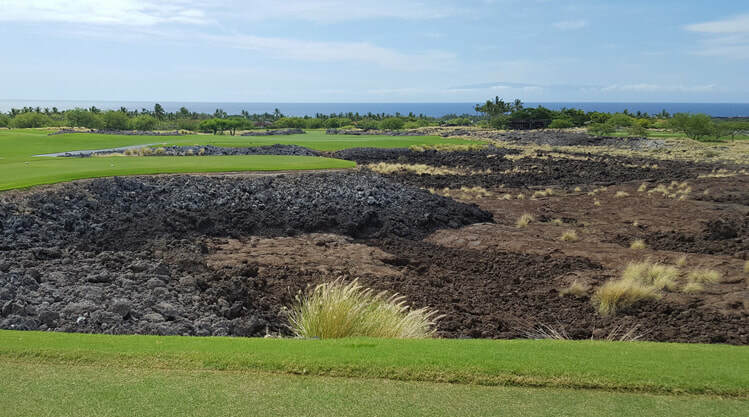 Hualalai Golf Course Hole 5: The course's first par three is a tough one with water on the right. Any pin right of center is especially dangerous. The bunker long and left will also make for a tough up and down. Hualalai Golf Course Hole 7: This downhill par five is unique. The driving areas is not as wide as others as the lava starts pinching in on both sides the farther the drive gets. The truly memorable part is the second shot that has to hit over lava or skirt through the narrow passage between two lava fields that are only about 15 yards a part in the middle. The approach is downhill to a relatively open green that slopes from back to front. Hualalai Golf Course Hole 8: This par three is downhill, but long, with nice views. The green is very large and there is a big bunker to the left and a rough covered down-slope to the right. 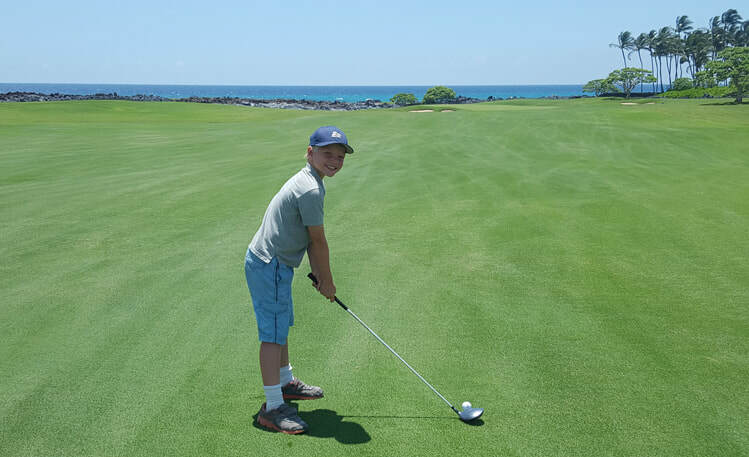 Hualalai Golf Course Hole 10: The back nine opens with a par five that doglegs to the right and then back to the left at the green. The best tee shot is actually over the tree on the right (if hit long) to leave a shorter approach. If going for the green, short and left are really bad misses with lava, trees and bunkers over there. 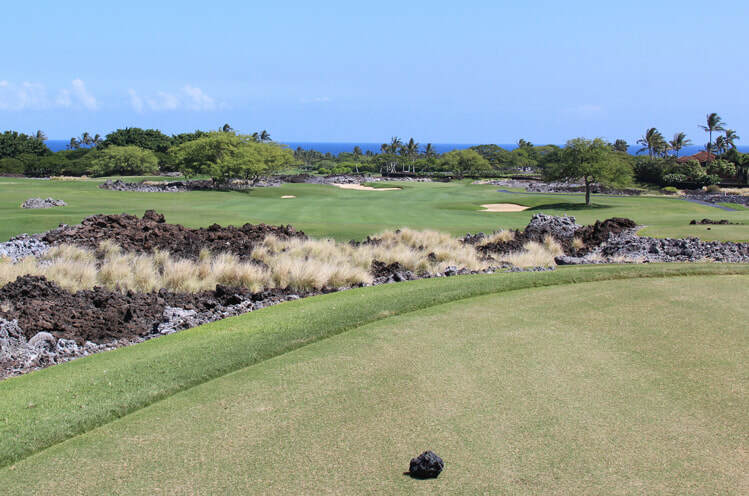 Hualalai Golf Course Hole 12: This little par three has views of a large lava field, but particular attention must be paid to the sand trap in the middle of the otherwise large green, which cuts it into four smaller quadrants. The large bunker with "lava islands" to the front of the green and lava to the left side are also nasty places to be. Hualalai Golf Course Hole 14: The day's last par five has nothing but lava to the left of the fairway for the entire hole. The fairway, however, is wide and, being uphill, with a well-guarded and narrow green, discretion on this hole can be rewarded, played conservatively. 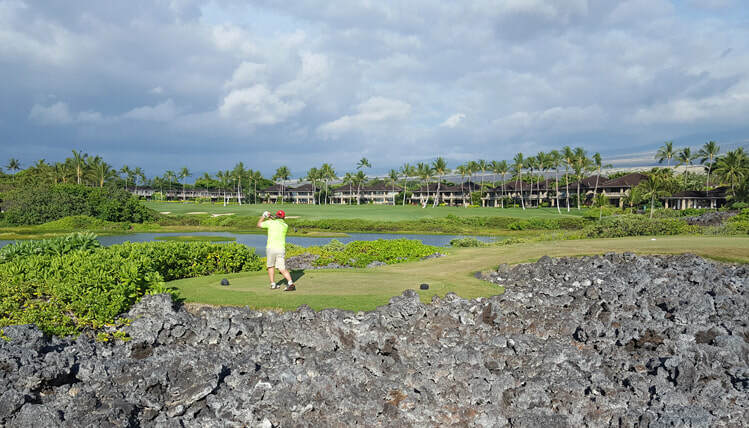 Hualalai Golf Course Hole 15: The player can easily be distracted by the massive lava rocks in the middle of the fairway but they are not really in play. The true danger on the tee shot are the series of bunkers to the right. The approach is a relatively tough one with a big bunker to the right and a green that angles mostly behind it. 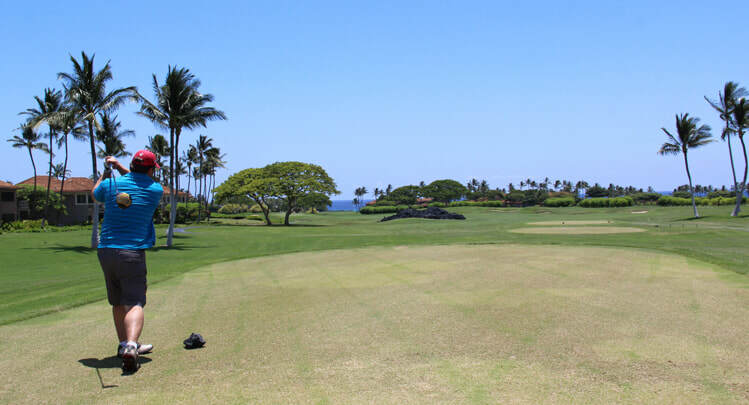 Hualalai Golf Course Hole 16: This par four takes the player down near the ocean. The dogleg right has deep bunkers to the right and OB to the left, so the drive is key. The green is then guarded by a deep bunker. 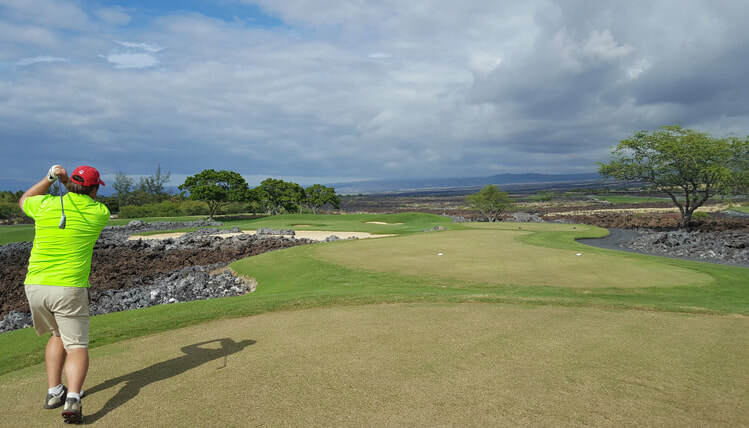 Hualalai Golf Course Hole 17: The signature hole is a par three down by the ocean with lava surrounding the area. 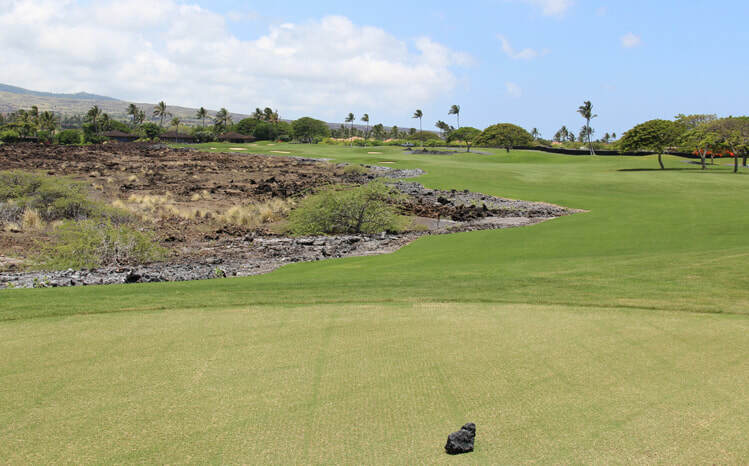 The green is pretty large but pin placement can be tucked near lava or behind the large bunker, which gives the hole many different challenges, not to mention the wind that can play a big factor. Hualalai Golf Course Hole 18: The tee box on the 18th is steps from the beach and sandwiched between lava and a lagoon and, thus, is one of the prettiest in golf. The hole itself is a mid-length par four that heads left around a lot of bunkers so the player has to determine how much to bite off. The approach is to a green with a big bunker to the left side, but otherwise, is pretty flat and open.